At twenty-nine, Connie isn’t exactly living her dreams. When her beloved gran died Connie returned to Hazelhurst, the village she grew up in, and took over her gran’s old job as caretaker at the village hall. It’s not a career in journalism as she’d hoped, but she loves working at Bluebell Hall. So when greedy property developers try to get their hands on it, Connie hatches a plan to save the hall, one bonkers enough that it just might work. All it takes is a needle and thread, scraps of old material and willing hands. After her grandmother died, Connie returned to the village of Hazelhurst to take over the role as caretaker of Bluebell Hall. At 29, Connie loves her job, but also feels that there is so much more that she can do with her life. Under Connie’s control, the hall comes under threat from the original family owners’ lawyers, who insist that the hall can only be used by the villagers, if at least 50% of them use it per year. This had become tricky lately as new houses were built locally, meaning more villagers. With the numbers down, and the deadline fast approaching, drastic action has to be taken, starting with bunting! 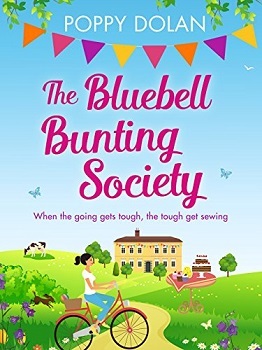 The Bluebell Bunting Society is a lovable, heart-warming book, about friendship and community spirit. Ms. Dolan has created a beautiful setting, just how I imagine a rural village to be. From beginning to end there are plenty of special moments, alongside lots of laugh out loud ones too. The characters are all so charming and are extremely likeable, especially ever-so-caring Connie. Although I would put this book in the ‘Chick-Lit’ genre, some of the characters have complex issues, such as Dom, who has been finding it difficult since his wife died, to know the best way to care for his teenage daughter Polly. The story is written beautifully and is captivating. It has that feel good factor to it. It certainly will give you a ‘pick-me-up’, when you’re feeling down. It has a calming affect, even-though the villagers are giving their all to save the hall. A superb book that will take your mind wandering to a little place with a big heart. Poppy Dolan lives in Berkshire with her husband. She’s a near-obsessive baker and a keen crafter, so on a typical weekend can be found moving between the haberdashery and kitchenware floors of a department store, adding to her birthday wish list. She has written three novels: The Bad Boyfriends Bootcamp, There’s More to Life than Cupcakes and most recently The Bluebell Bunting Society. The Bad Boyfriends Bootcamp made it into the Amazon top 100 bestseller chart, so clearly someone other than her mum must have read it. She’s currently working on her fourth novel – it’s about friends, siblings and crafty things – and drinking far too much tea.